Do you want to give a special gift this time? 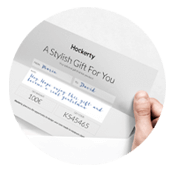 With Hockerty gift card and gift box options, you can take the guessing out of your gift-giving clothing and let him enjoy the freedom of designing his custom made garment. Print their gift card at home or work. Then gift at your convenience to the lucky recipient with a personalised message.